The 15.6" Razer Blade 15 Gaming Laptop is designed for gamers who don't want to compromise between performance and portability. Specs-wise, it's powered by a 2.2 GHz Intel Core i7-8750H six-core processor, 16GB of DDR4 memory, a 256GB PCIe NVMe SSD paired with a 2TB 5400 rpm HDD, and an NVIDIA GeForce GTX 1060 graphics card with a Max-Q design. By utilizing NVIDIA Optimus technology, this system can swap between its dedicated and integrated graphics unit for performance vs power saving. Other integrated features include 802.11ac Wi-Fi, Bluetooth 5.0, USB Type-A, Thunderbolt 3, HDMI, Mini DisplayPort, and a 3.5mm combo audio jack. The operating system installed is Windows 10 Home (64-Bit). The 15.6" IPS display has a 1920 x 1080 Full HD resolution for crisp and clear details. It also has 100% sRGB color support for accurate colors. The Blade 15 features a compact aluminum unibody design that keeps it lightweight and durable. Its slim bezels also provide you with a more immersive viewing experience. Using the Razer Synapse 3 software, you can customize the RGB backlighting on the keyboard to fit your preference. Razer Chroma lighting offers over 16.8 million colors to choose from and a variety of lighting effects. Aside from customizing the lighting on the Blade, the Synapse 3 software also supports custom profiles, fan adjustments, and even Gaming Mode for increased graphics performance. 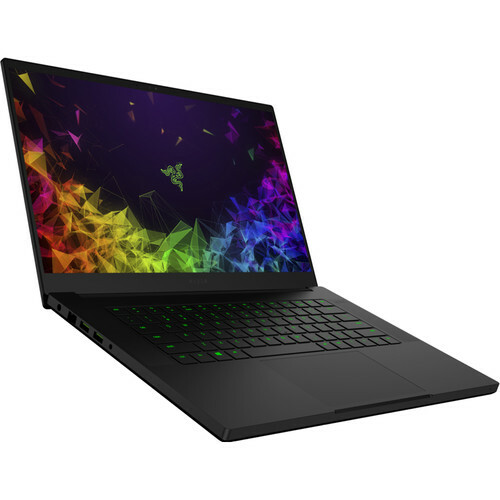 Box Dimensions (LxWxH) 20.5 x 13.6 x 3.4"
15.6" Blade 15 Gaming Laptop is rated 1.5 out of 5 by 2. Rated 2 out of 5 by Peter from Screen issue I saw the other review about screen issues and wanted to chime in as well. Overall I like the build quality of the laptop, its pretty nice. After a few days of using it, I also got screen problems. Mine was a bit weird. On a cold start , the display would be almost all white and slowly over time the display would go back to normal fading from the middle to the edges of the screen until eventually being almost normal. Also waiting on replacement. Rated 1 out of 5 by srinivasreddy from bad out of box experience the unit I received has screen flickering isuue. just after two days of use the screen started flickering.Thought not as bad as lenovo laptops but occasional flickering. waiting for my replacement unit. Is this a good choice of laptop for content creation works? Yes, this laptop is ideal for content creation due to its dedicated NVIDIA GeForce GTX 1060 with 6GB GDDR5 VRAM.